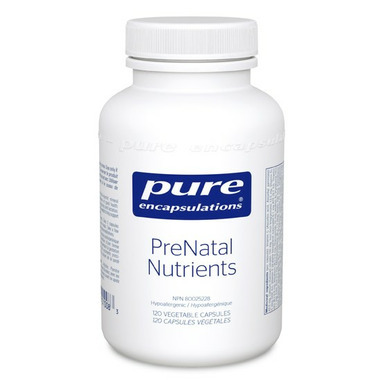 Pure Encapsulations PreNatal Nutrients is a hypoallergenic, highly bioavailable multivitamin and multi-mineral formula designed specifically for pregnant and lactating women. PreNatal Nutrients provides the nutrients needed to help support maternal and fetal health, such as iron, selenium, zinc, biotin, niacin, thiamine and riboflavin, in the doses that are consistent with the accepted Health Canada recommendations for pregnant and lactating women. Furthermore, PreNatal Nutrients provides 1 mg of folate (as folic acid and Metafolin® 5-MTHF, the naturally occurring, universally metabolized form of folate) for healthy neural and cellular development of the fetal brain and spinal cord, helping to reduce the risk of neural tube defects when taken daily prior to becoming pregnant and during early pregnancy. It is also enhanced with increased vitamin D and vitamin K for bone health, plus chromium to provide support for healthy glucose metabolism. Beta-carotene (provitamin A) is also included to help maintain skin and immune function. Zinc (Zinc citrate) 7.5 mg, Selenium (Selenomethionine) 35 mcg, Copper (Copper [II] bisglycinate) 1 mg, Manganese (Manganese aspartate) 1 mg, Chromium (Chromium polynicotinate) 60 mcg, Molybdenum (Molybdenum aspartate) 37.5 mcg, Beta carotene 2,400 mcg (4,000 I.U. ), Zeaxanthin (Purified marigold flower oleoresin) 34.5 mcg, Lutein (Purified marigold flower oleoresin) 132.5 mcg, Lycopene (Lycopersicon esculentum-fruit pulp) 66.5 mcg.